This article applies several conflict analysis tools to the tensions between different communities living in the forest in the Congo Basin as well as to the confrontation between those living in the forest and organisations in charge of nature conservation, such as the State and the World Wildlife Fund (WWF). The second part of the article analyses how different stakeholders act on these disputes in the three national parks of south east Cameroon. Governments, NGOs, logging companies and safari hunters are increasingly struggling to involve the local populations in the implementation of local conservation and development projects. Most of their efforts have not yielded expected effects. In order to reverse this failure, and transform conflicts in these areas, conservation and development managers should incorporate indigenous knowledge to design and implement appropriate strategies to manage biodiversity conservation. Conflict is a universal feature of human society. It takes its origins in economic differentiation, social change, cultural formation, psychological development and political organization – all of which are inherently conflictual – and becomes overt through the formation of conflict parties, which come to have mutually incompatible goals. The identity of the conflict parties, the levels at which the conflict is contested, and the issues fought over (scarce resources, unequal relations, competing values) may vary over time and may themselves be disputed. 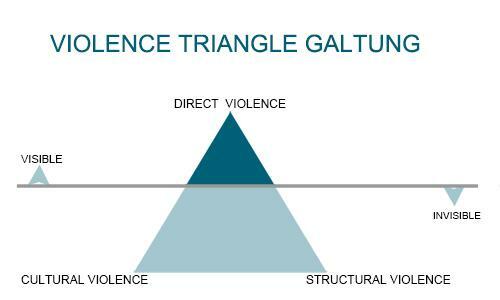 Conflicts are dynamic as they escalate and de-escalate, and are constituted by a complex interplay of attitudes and behaviours that can assume a reality of their own. Third parties are likely to be involved as the conflict develops, and may themselves thereby become parties in an extended conflict. An important point to note from the outset is how early theorists in the field such as Morton Deutsch (1949, 1973) distinguished between destructive and constructive conflict, suggesting that the former was to be avoided but the latter was a necessary and valuable aspect of human creativity. Without conflict our societies will remain static. Our study site is the Three National Parks (TNP) of southeast Cameroon namely Lobeke Boumba-Bek and Nki national parks. The main actors in these forests are the Pygmy population living from hunting and gathering (Baka), the Bantu population for whom subsistence farming is the main source of income, the state and international organisation such as the World Wildlife Fund (WWF) and the German International Collaboration organisation (GIZ). Baka have traditionally lived in ’mongulus’, these are huts built with leaves. These igloo-shaped huts are developed for nomadic life in the forest, and are fragile temporal structures. Mongulus are constructed by women and they have no ventilation as they are built without windows. At night the doors are covered with mats and the floors are bare. Banana leaves spread on the floors serve as beds. In the permanent settlements, Baka have started to construct ’Bantu-type’ of houses, which are generally built out of bamboo sticks, clad with mud. They live a more settled way of life, even though many of them still spend a lot of time in the forest camps, hunting and collecting. 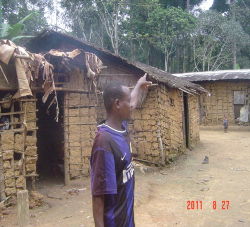 When some families leave the village for some time, other villagers always stay to survey the houses. A Baka child from the forest with caterpillars. By Sakah Theresia Lola, 12/4/2011. 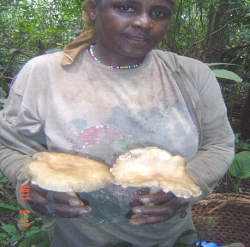 A Baka woman presenting mushrooms, a medicinal liana and demonstrating the application of medicine on an abscess to the research team during a participant observation in the forest around Mambele. By Sakah Theresia Lola, 12/4/2011 at 8.30am, 10.20am, 11am and 12.30pm respectively. Each actor mentioned above has an interest in the natural resources present in the area. Conflicts occur frequently among stakeholders in and around the TNP. The issue at stake is that, although the government of Cameroon and other forest management stakeholder’s wish to involve local communities in the management of forest resources, conflicts still persist. The consequence is the continued destructive use of the resources by the various stakeholders who have different perspectives, goals, values and interests1. The views and norms of local communities living in the forest are violated by more powerful social actors including the government. In our study site the indigenous people perceive the state and other stakeholders as those who want to take away what belongs to them, while the Bantu, living from agriculture, perceive the Baka, who live from hunting and gathering as their slaves. Conflict behaviours here include threats of different types and violence. The Three National Parks (TNP), Lobeke, Boumba-Bek and Nki, are found in the south-eastern part of Cameroon and constitute part of what is currently called TRIDOM (Trinationale Dja-Odzala-Minkébé) Landscape Cameroon segment. 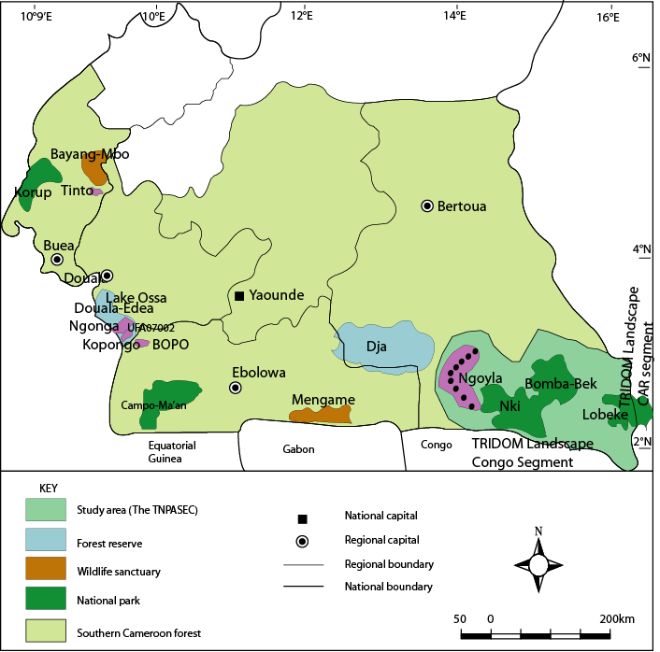 The three parks constitute the famous trinationale de la Sangha transboundary conservation initiative, which is part of the Congo Forest Basin, shared by three nation-states (The Republic of Congo, the Central African Republic and Cameroon). This Trinationale de la Sangha is managed by WWF and is located in the southeastern tip of Cameroon and across the border with the Central African Republic and the Republic of Congo. It encompasses the recently created Lobéké National Park. Source: Adapted from the administrative map of Cameroon 1992, Ndamou, 2001 and WWF 2008 by Sakah Theresia Lola, 2013 and drawn by Enchaw, G.B., 2011. One of the classical tools in conflict resolution distinguishes between positions (i.e. concrete demands) that parties to the conflict stand for and their underlying interests and needs. 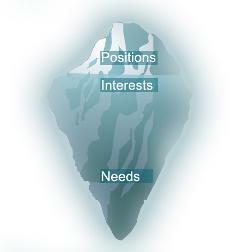 Interests are often easier to reconcile than concrete positions, since there are usually several positions that might satisfy them. This model is commonly called the PIN tool. Here, John Burton’ theory on fundamental needs (1990), is represented in form of a tool commonly called the PIN tool. The resolution of a conflict depends on the will of those involved to satisfy the frustrated needs and contested norms of parties involved in the conflict. The tool presents the possibility of analysing conflicts by identifying the positions, interest and needs of actors in conflict. Below are the various actors involved in the conflict in the forest area of the Three National Parks and their needs. The “P” in PIN stands for positions. The point in the conflict over forest resources is that all parties want to assert their position in the management of the resources over which each party claims rights and ownership. The underlying conflict is about the use of the space but it also concerns worldviews. The sacred holds an important place for among the Baka and Bantu communities living in the forest which takes the form of conservation related legends, myths, rituals and sacred sites. Their relationship to the land is utterly different from that of the government with its laws and that of international wildlife conservation organisation with their management standards. The Bantu peoples in Lobeke and Boumba-Bek are sub-divided in to several ethnic groups, of which the Bangando constitute a majority in this area. During fieldwork we observed that the Bangando communities around Mambele have deep rooted alliances with primates, partly arising from periods of conflict with other communities long ago as well as during the struggle for independence more recently. According to the legends of the Bodawa, monkeys helped them to escape from danger that was coming through the forest by alerting them with a sharp sound. Bodawa cultural history is also filled with stories of gorillas and chimpanzees helping old people and women carry heavy loads over long distances through the forest. Moreover, locals believe that primates recognise Bodawa in the forest and do not attack them. They are forbidden to eat their meat. Intermarriage between local groups has widened the application of these beliefs. Many Baka also have well-established alliances with certain Bangando groups, and have adopted their customs of not eating some animals considered as their totems. In addition, a Bangando seldom kills an alligator. According to a legend, this is because they were able to successfully cross the Kadéi and Boumba rivers, abundant with alligators. The fact that they were not attacked by these reptiles has led to a deep respect for the alligators and an ascription of their name to the clan. As a result, the pressure on the species is limited. The taboo on killing these animals serves as an effective tool of traditional conservation. Both Bangando and Baka folklore and legends are centered on the forest. Among the Baka clans each of the totems, listed in table 2, corresponds to a forest animal. Membership to a particular totem was alleged by some kôbô (elderly) informants passed from father to his children after his death. The kôbôs also said that wives become members of their natal clans only after marriage. People who belong to a particular clan do not eat their animal totem, thus conserving that animal species from extinction. 1) The bouonlup site situated at about 15KM from the village Eta Chefferie, this site is home to several wild gorillas which are quite hostile to any human presence. This could be attributed to the burial of the great sorcerer AMBOH in the vicinity. 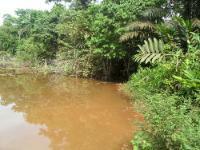 2) The peace clearing “dââ le nkô –lebeha ” situated close to the Adinko stream. This clearing is special resulting from the peace that reigns between the animals and humans that inhabit the area. Going by the testimonies of hunters, panthers and hares are seen together without the latter hunting the former. Generally, there is no fighting within this zone. 3) The Lekih le Nkô Lebeha. This very high mountain is equally situated within the peace clearings. Based on testimonies and without any vivid precisions, several mysterious activities occur at the top of this mountain. It is said that up until this day, no human has yet attained its summit. 4) The nki water-fall « Lessok lé Nki ». In this water fall, water tumbles intermittently with violence. It is equally said that there are very strong magnetic forces in the water all through the year. Thus the Baka and the Bangando view these places as holy and hold them sacred. As field informants confided, the forest is a place of considerable spiritual and emotional value and it is in the forest that they performed, and in some cases still perform, their rites of passage and other important rituals and ceremonies to maintain harmony with their ancestors. In their view, these ancestors intercede on behalf of the living since they are closer to Komba than the living. Some of the rites they usually performed were to beseech the ancestors to intercede for women’s blessing and fertility. Through these ceremonies, birth rate was said to be very high and some women who were unable to give birth started bearing children. For men, the forest is a soil for circumcision ceremonies. 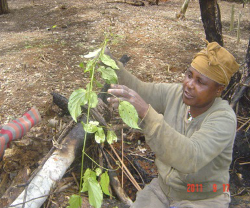 All these cultural activities were and are regulated and guided by forest spirits such as Njengi. Field informants said that the forest is the dwelling place of Njengi. The Baka community sees Ngengi (god) as the custodian of the forest. In their opinion, Njengi dwells in particular portions of the forest with an aura of sacredness. These are the sacred forests, which were confirmed by respondents to either have existed or still exist. The position of the government and conservation NGOs towards the forest is very different from that of the indigenous people. During fieldwork we observed that the expulsion of the Baka people from the forest and the creation of many protected areas (national parks, forest management units, sport hunting zones and forest reserves) largely affected their spiritual and religious attachment to the forest. Interview data revealed that while still in the forest, the Baka had many sacred forests and the forest had greater connotative meaning to these indigenous peoples than just a place with flora and fauna as seen by the government and conservation NGOs. Baka had their sacred places and shrine in the heart of the forest, which today has been transformed into national parks and forest management units (UFAs). The groves in the forest in which Njengi spirit dwelled and which used to be biodiversity hotspots and places where they commune with their ancestors for harmony and good health have been transformed into UFAs and allocated to logging companies. The participants alleged that the logging companies have depleted most of the tree species in the Njengi forests forcing the forest spirit of the Baka to escape far away in to the forests. The animals that were in the forest groves have either escaped or hunted. As they said, the depletion of the forest has forced Njengi to escape. The I in PIN stands for interests. All actors concerned in the conflict over forest resources have different interests in conserving biodiversity in this area. 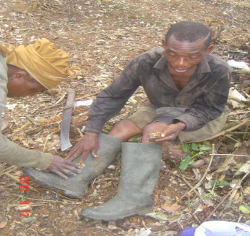 Indigenous people such as the Baka Pygmies and the Bantu villagers have historically inhabited and depended on the biodiversity in the areas which have recently been transformed into Boumba-Bek, Lobeke and Nki National Parks. Other important stakeholders in this area are migrants or settlers and economic operators whose interests are tied to the exclusion of the local communities from ownership over and managing of the parks area. These stakeholders include tourists, hunters, as well as local and international non-Governmental Organisations (NGO) and the state. They value the national parks for its flora, fauna, scenery, and wilderness characteristics without taking into consideration the interests of the surrounding local communities. Both the variety and number of stakeholders and the inter-play among local and international interests, present challenges that require a holistic approach to be understood, managed and addressed (Lewis, 1996). The N in PIN stands for needs. The indigenous people expect to see developmental projects being undertaken in these areas funded by the profits from logging companies. They equally expect to have some basic fundamental needs met by the state and the international NGO’s. The government’s concern is to conserve the biodiversity in the area and ensure the protection of endangered species of animals while WWF and GIZ raise awareness about the natural resources found in the reserve especially non timber forest products, conservation of biodiversity, sustainable management of forest through the Programme Sectoriel Foret et Environment. Their buzzwords are reduction of poverty, good governance and reinforcement of capacity building. Another tool that can be used to analyse this situation is the conflict tree. It is a visual tool used to better understand the core conflict in terms of its causes and impacts. One can use the conflict tree to lay out the main aspects of a conflict. Firstly, the core conflict or the prioritized conflict, the one that the analytical exercise will focus on (the trunk). Secondly, its underlying causes (the roots) and finally its effects (the branches). An example from Queen Elizabeth National Park in Uganda can be found below (PA = protected area) which is also applicable to the TNP of Cameroon. In the above diagram, when we talk of the notion of conflict we look at the root causes. Hence, in the process of conflict transformation these root causes have to be dealt with in order to put in place sustainable changes in the conflict area. If these causes are not taken seriously by competent authorities it can lead to a situation of direct violence. In the TNPs of southeast Cameroon the trunk of the tree or the core problem is the encroachment of indigenous people into the protected. 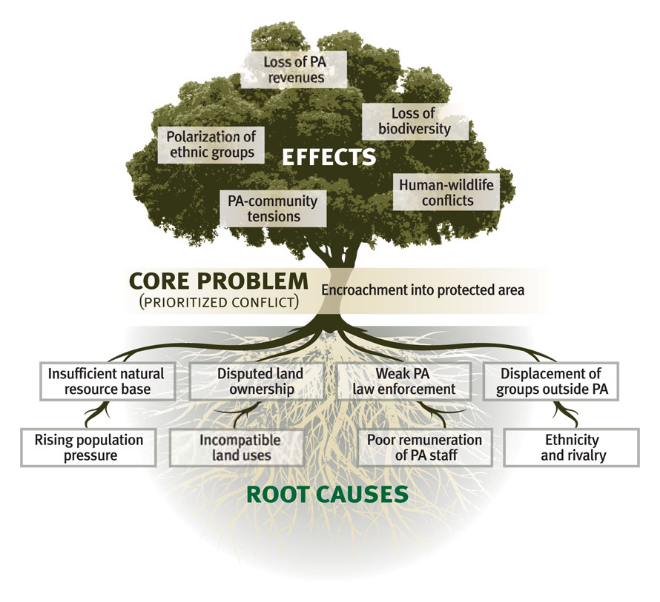 The root causes of conflicts in the management of these protected areas are ethnic conflicts between the Baka and the Bantu, poor remuneration of some staff, especially the support staff like the guides who are usually Baka, incompatible land use, rising population pressure which forces the inhabitants to search for farm land in the protected area and the displacement of groups outside protected areas. The case of the eviction of Baka from their ancestral home, disputed land ownership, an insufficient natural resource base and weak law enforcement in the area are additional root causes. The effects are loss of biodiversity, human/wildlife conflicts, conflicts between indigenous people and eco-guards, loss of revenue and profits from forestry royalties and COVAREF end up in the hand of few self-interested elites. Tensions and animosity are predominant in the community. Protected areas can be seen as arenas of conflict in the TNP area as already discussed. One of the causes of the violence is the eviction of indigenous Baka Pygmies from the forest to resettle along the major road axes under the authority of Bantu chiefs who divested them of land and resource tenure rights. Baka are victims of servitude and this has engendered horizontal conflicts between them. Horizontal conflicts according to Mope Simo (2001) are those that occur between the same stakeholders or sometimes between different social categories of actors. In our context, horizontal conflicts are inter-community conflicts, between Baka and Bantu communities, over settlement and land for cultivation and gathering. Conflicts between these indigenous peoples and the local communities have multiplied. While vertical conflicts are those that occur between the powerful and weak stakeholders. In this case it will be land disputes that occur between the local communities and the state (that is management authority of the park) logging companies and safari hunters. These vertical conflicts were also alleged to take the form of constant quarrels between local peoples and park guards and in some critical cases have led to attacks on park guards. Informants supposed that sometimes, when the local and indigenous peoples are caught with bush meat they poison some of this game before handing it to the forest guards. Some of the local peoples were even reported to have been deliberately throwing poisonous chemical substances in rivers to destroy fish as a means of fighting back reprisal from WWF staff, forest guards and forces of law and order. Aggressiveness towards resources as a result of frustration is common in the TNP. In our study site, cultural and structural violence manifest itself in an invisible manner, cultural violence is manifested by expatriates who do not respect the cultural norms of biodiversity regulation in these zones which were regulated by taboos and the severity of the taboos depended on the type of sacred forest. Foreign stakeholders do not respect these indigenous regulations. The custodians of the Njengi sacred society said that they usually killed an elephant as a sacrifice to their gods once a year as a means to appease and strengthen harmony with the gods of the land. The inhabitants still reverend Njengi and practise witchcraft. In almost all the Baka communities there was a lot of bitterness that the patches of forest they attributed to their forest spirits were being destroyed by logging companies and Bantu communities. These forms of violence are coupled to structural violence in the form of laws and institutions put in place by the government and which are not respected on the ground. The 1994 law on forestry and wildlife especially led to frustrations among the indigenous people. Direct violence can be observed in the case of open confrontations between local communities and safari hunters. The latter hinder indigenous peoples from collecting non timber forestry products from UFAs, justified by the argument that they make noise and send away animals to hiding places in the park. In addition, eco-guards frequently fight with indigenous people over game as shown above. 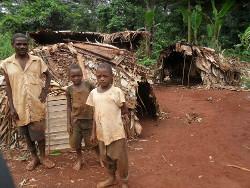 Those who act on the conflict in this area are GIZ, Plan Cameroon, the church and the state. The state has tried to work on these problems through its legal institutions like the implementation of the Forestry Ordinance of 22 May, 1973 that went operational on 5 August, 1974 which introduced the land title registration system. The 1994 law on forestry and wildlife, which stipulates that, the indigenous people should participate in the management of natural resources found in their vicinity. The objectives of these actions are to ensure participation of indigenous people in the management of what they believe is theirs and to ensure equal sharing of benefits from the resources. GIZ intervenes through raising awareness of the laws and Plan Cameroon’s works for the eradication of illiteracy among Baka children. The impact of these actions on the conflict dynamics is that it has led to increased tension among indigenous people and a lack of trust between the indigenous people and other stakeholders, WWF in particular. Consequences of these actions are that it has led to mass destruction of the forests; illegal hunting, thus killing rare species of animals that are protected and finally angry indigenous people that help poachers from neighbouring countries to kill endangered animals like elephants for their tusks. The contributions of the state in the management of conflict in the TNP area can be seen in the following areas. Structurally the state has put in place the 1994 Forestry and Wildlife Law which made provision for the classification of wildlife in the country into classes A, B and C. After this classification, wildlife hotspots such as the Boumba- Bek, Lobeke and Nki National Parks were created in the southeast forest zone of Cameroon in order to control the high pressure exerted on fauna resources. Similarly, the creation of ZICs and ZICGCs was one way of developing a sustainable system of managing the peripheral zones of the permanent forests (national parks) in order to guarantee permanent availability of wildlife resources in the created biodiversity hotspots (AFTEN, 2008). Over the last decades, the government has been generating forestry royalties from timber concessions and these royalties are distributed between the State and local communities where deforestation has been perpetrated. According to some scholars like Logo (2003) as well as the Cameroon Tax Code 2011, 50% of the forestry royalties go to the State, 40% to the councils in which logging activities are taking place within their area of jurisdiction and 10% to the villages within those council areas. The state has also created community hunting zones that are managed by the local people. The informants during fieldwork explained that the ZICGCs were zones in which local populations carried out hunting activities while COVAREFs were for the management of proceeds from hunting in the ZICGCs and 10% of proceeds from ZICs are destined for local development. WWF workers attested that they were working hand in hand with the state to see how the Baka could be granted an elephant for their annual sacrifice. Churches present in this area work on reducing tensions by sensitizing the people that all people are made in the image of God and that everybody is equal in the eyes of God. Since the majority of local people are Christians and animist they try to respect their Baka brothers but the church still has to go a long way for mutual respect to exist. Finally, Plan Cameroon is active in education (Centre d’Education de Base), in Pygmy villages in the East of Cameroon, funded by Plan’s partner organization, Association pour l’autopromotion des populations de l’Est du Cameroun (AAPPEC) a local NGO. They have opened Baka schools to educate the Baka so they can find work. Despite these efforts of Governments and conservation NGOs to encourage local institutions to manage community hunting zones and community forest, the participatory approach has not succeeded. Indigenous people are still not satisfied because they feel that they are exploited by the most powerful stakeholders and what they gain in return is not commensurate to what other stakeholders profit from. Thus peace has not been installed in this area. The limitations of the above actions are that the government and other stakeholders have very good laws but field experience has clearly shown the paradox of conservation. What is written in public policy is not respected on the ground. In addition, community forests, forestry fees management and COVAREF committees are ineffective. The role of middle-level elected authorities (the mayors), middle-level administrative authorities, and non-governmental organizations is particularly significant in the area. Decentralization has not brought the expected results, mainly because of constant power struggles at various levels. In the spirit of Foucault, power is in the hands of a small minority, to the detriment of the others, the powerless. The persistent failure of the participatory process in biodiversity conservation is an indicator that the current strategy is not working well and something must be done about it. However although some stakeholders are unanimous that the current strategy should be changed, most of them are still at the crossroads because no sustainable solution has so far been found. 1The term ‘interest is used throughout this work to mean people‘s fundamental needs and concerns. Most often such interests are violated or side lined by more powerful stakeholders, including the state apparatus. AFTEN, 2008 (World Bank Environment and Natural Resources Management Division) The Rainforests of Cameroon: Experience and Evidence from a Decade of Reform. Washington, D.C.: World Bank. Bigombé, P. 2003 “The Decentralized Forestry Taxation System in Cameroon. Local Management and State Logic”. Working Paper Series 10, Environmental Governance in Africa Series. Washington, D. C: World Resources Institute. Burton, John. (ed.) 1990: Conflict: Human Needs Theory (vol. 2 of the Conflict Series). London: Macmillan. Galtung, Johan. 1996: Peace by Peaceful Means: Peace and Conflict, Development and Civilization. London: Sage. 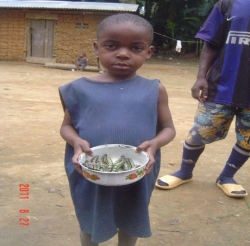 Mope Simo, 2001, Issues in Conservation and development in Cameroon: Destructive uses of the Resources of Lake OSSA Area and the Ensuring Poverty Syndrome. Yaounde.